The Instrument Channel Settings page contains options for additional changes to sample playback. This tab is available for Sampler instruments and Sampler plugins. Not all plugins will have this tab. 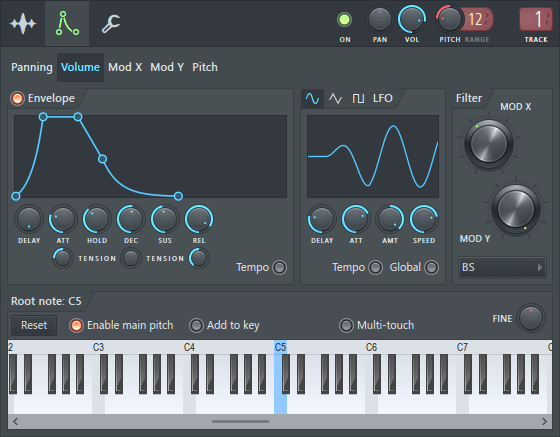 Contains envelopes and LFOs for Panning, Volume, Mod X, Mod Y and Pitch values in the Sampler. The tab buttons bar at the top of the Instruments Channel Settings lets you choose which envelope/LFO to edit. There are four envelopes (pan does not support an envelope) and five LFOs for each setting on the tab bar. An envelope is applied only when it is turned on from the orange LED at the top-left corner of the envelope section. Envelopes in this section behave much like standard ADSR envelopes, but they have been enhanced with a few additional properties (delay, hold and amount). You can control the envelope properties using the knobs, or by dragging (up/down) the elements within the envelope preview. Delay - Delay can be used to add a gap between the start of a note and the envelope attack state. Attack (ATT) - Controls the attack length of the envelope (attack shape in tension edit mode). Tension (below the knob) - Controls the convex/concave shape of the curve. Hold - "Holds" the attack at its maximum level for a period before the decay starts. Decay (DEC) - Controls the decay length of the envelope (decay shape in tension edit mode). Tension (below the knob) - Controls the convex/concave shape of the curve. Sustain (SUS) - Determines the sustain level of the envelope. Release (REL) - Determines the release length of the envelope (release shape in tension edit mode). Tension (below the knob) - Controls the convex/concave shape of the curve. Amount (AMT) - When available, this is a global multiplier value for the envelope as it's applied to the target it's modulating. If the Amount knob is centered (AMT = 0), the envelope will NOT be applied to the values. Turn right for positive multiplier values and left for negative multiplier values (this inverts the effect of the envelope). Tempo - Turning this option on makes lengths of attack, hold, decay, etc. tempo based, so they change whenever the tempo is changed. With this option checked, you can Right-Click all knobs in an envelope section (except Amount and Sustain, which don't set a time period) and open the Set submenu that contains some pre-defined tempo-based lengths. Select any of these to apply them. If you select a pre-defined tempo-based length from this menu and the Tempo Based option is not checked, it will turn itself on automatically. This section applies LFO modulation to pan, volume, cutoff, resonance and pitch settings. You can choose from three LFO shapes - sine, triangle and square. The shape selector is located in the top-left corner of the LFO section. Delay - May be used to add a "gap" between the start of a note and the application of the LFO. Attack (ATT) - Sets the attack length in the LFO modulation. Amount (AMT) - Is a global multiplier value to control how the LFO envelope is applied to the target it's modulating. If the Amount knob is centered (AMT = 0), the LFO will NOT be applied to the target. Turn right for positive multiplier values and left for negative multiplier values (this inverts the phase of the LFO). Speed - Controls the frequency (speed) of the LFO. Tempo - Turning this option on makes lengths of delay, attack and speed tempo-based, so they change whenever the tempo is changed. With this option checked, you can Right-Click all knobs that control those values in a LFO section and open the Set sub-menu that contains some pre-defined tempo-based lengths. Select any of these to apply them to the knob. If you select a pre-defined tempo-based length from this menu, and the Tempo Based option is not checked, it will turn itself on automatically. Global - Turning this option on applies the current LFO setting globally, so that it does not restart in the beginning of each note. If unchecked, the LFO is applied to each note locally. Fast LP - Light CPU load, Low Pass filter (frequencies above the 'Cutoff' band are cut). LP - Low Pass filter. BP - Band Pass filter (frequencies either side of the 'Cutoff' band are cut). BS - Band Stop filter (frequencies at the 'Cutoff' band are cut). LPx2 - Low Pass filter steep cutoff. SVF LP - State Variable Filter Low Pass. SVF LPx2 - State Variable Filter Low Pass, steep cutoff.